When cancer stopped Sanna Leinonen in her tracks in 2009, she made the decision to not take life for granted. Nearly a decade later, her courage and determination has brought her new adventures, as well as a successful business. 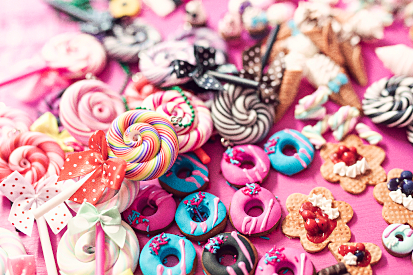 From her pink workshop, she is spreading happiness in the form of sweet-shaped jewellery. In 2010, having taken time off from her career as a restaurant manager following a cancer diagnosis and treatment, Leinonen received two packs of modelling clay from her mother, who hoped that it would provide Leinonen with a nice, relaxing hobby. Those two packets, however, were just the beginning, as Leinonen’s new hobby quickly took on a life of its own. “Initially, I would only do abstract shapes and turn them into jewellery,” Leinonen explains. “My friends and colleagues quickly got interested, and one of them asked if I would make her an earring shaped like liquorice allsorts. I wasn’t keen on the idea, but she persisted and I finally obliged, and posted a picture of the finished earrings on social media. Overnight, I received tens of messages from people who wanted to know where they could buy jewellery shaped like sweets — and the rest is history,” she laughs. For a while, Leinonen would make jewellery on her kitchen table, but, as her business grew, she soon realised that she needed somewhere bigger to work. She therefore bought a van, painted it pink, and toured around Finland selling her sweet jewellery. The hobby soon became a job, and now Leinonen has a jewellery factory built in her backyard. Inside the factory, everything is painted pink — pink microwave, pink sofa and cushions, pink carpets and a pink fridge. “I love the colour pink; it brings me so much happiness,” Leinonen says. “When I sell my jewellery at stalls around the country, I always note how people are in such a rush, but when they walk past my stall, they often stop in their tracks and take a moment to look at my pieces — and they always smile. That smile is what I want to capture. It’s a big reason behind why I keep doing what I do.” She adds: “Something draws people in when they see my jewellery. Maybe they see their favourite sweet from their childhood, or remember how their grandparents used to offer a particular sweet. Leinonen is the kind of person who decides to do something and will do whatever it takes to achieve it. “I’ve always been determined, but also incredibly stubborn. If you tell me to go left, I will most likely turn right,” she laughs. Her strong-mindedness is clearly paying off: Elvari jewellery is currently sold online, as well as by over 70 retailers in Finland, and business is booming. All of Elvari’s pieces contain Leinonen’s fingerprint because all the jewellery is made by hand. “I want all my jewellery pieces to have been held in my hands and moulded by me,” Leinonen says. Working with polymer clay means that she can mix any colour and turn the jewellery into any sweet-like piece imaginable. “I find my work very therapeutic. It’s precise work, and some pieces are painted by hand. On a pair of popcorn earrings, for example, the kernels are hand-painted to mimic melted butter and unpopped kernels,” she notes. And where does the company name, Elvari, come from? “Elvari was my cat, and my companion while I was moulding the very first pieces of jewellery on my kitchen table. He would always jump on the table, and sleep next to me for as long as I worked, so I thought it was only appropriate to honour him,” Leinonen explains.